Reporters from CNN and NBC had to issue corrections after tweeting that Huckabee himself thought women couldn't control their libidos (rather than Democrats thinking that). But Mediaite points out that "the first impression will be the one that sticks." White House spokesman Jay Carney said he hadn't seen the comments, but he called them offensive after hearing an excerpt, reports the Hill. "Whoever said it sounds offensive to me and to women," he said. Huckabee has made similar comments before, including on his Fox show just a few days ago, Slate notes. "For Democrats to reduce women to beggars for cheap government funded birth control is demeaning to the women that I know who are far more complicated than their libido and the management of their reproductive system," he said. One of the many problems Alexandra Petri at the Washington Post has with Huckabee's "three-coil steamer" of a speech is the way he seems to be addressing women as if they were in the kitchen, not in attendance. "The short version is that you should talk to women as though they are in the room," she writes. "That’s it. It’s that simple." Nice thing about this? 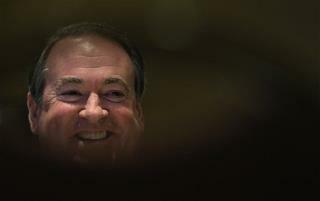 Huckabee just precluded himself from ever holding public office again.